Detect when salt level in water softener is low? I’ve recently had a water softener installed and rather than estimating when I should check it and refill the salt I thought it would be great if a sensor could alert me. I use small salt tablets and essentially the salt level is too low when the brine is visible and above the salt tablets. I don’t think you will be able to do it with an “off the shelf” solution. However, there is a (relatively) easy solution if you don’t mind a bit of tinkering and soldering. I ran across this project last year and I’ve replicated it for my saltwater aquarium sumps. It’s actually REALLY easy and cheap. For my three sumps, I spent a total of $9 for each originally. Then, I modified them to use an optical water sensor as opposed to bare wires which was a little more expensive (https://www.amazon.com/Copapa-Horizontal-Liquid-Switch-Sensor/dp/B00AKW29U2). Hmm. Maybe I don’t properly understand how the brine tank works in a softener but in my softener the water level always seems to be around the same, quite low level, regardless of whether the salt level is low or fully topped up. I know I need to top up the salt when I see that the salt has reached a low enough level for me to be able to see the water, i.e. the salt is at or below the level of the water. So looking at that project, it suggests putting the sensor at a fixed point just above the highest level the water can reach. If I did that, the sensor would never trigger because the water level doesn’t really move, it’s the salt level that moves. Or am I missing something…? That’s what the float sensor would do for you. Basically, when you put salt in, you want to have it so the sensor is closed (you mentioned salt tablets). As the salt level drops, the sensor will open and trigger the esp8266 to send a notification. Basically, you want to flip the project so that instead of reporting on water level too high, you want water level low. What has the sensor closed got to do with salt tablets? How will the sensor open as the salt level drops? 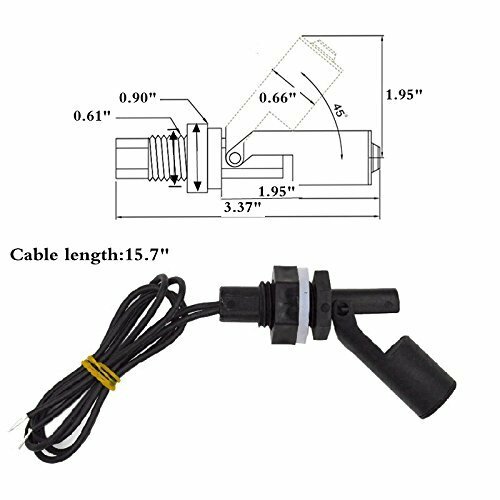 I’m in the UK so if I am to search for a float sensor of the type you’ve linked to on Amazon, what should I look for? No worries! Learning and experimenting is the fun of all this automation stuff! Ok. So, in the project I linked, he’s using the wires to detect when the water level gets too high. I’m suggesting the opposite of that. But, in order to do that, you need something that will sit above the water level and then drop (or open) when the salt depletes itself. That’s where the float sensor comes into play. It basically opens and closes a circuit (which you would wire the same way as in the project I linked) based upon salt level. So, in your case, take the salt tablets and basically prop them under the float sensor, forcing it to be closed. As the salt drops, the sensor will open and trigger a notification. On the right hand side is the actual switch. When it is up, it’s closed. When it’s down, it’s open. If you put some salt tablets below it to raise (close) it, then as the salt drops, it will open the circuit and send a notification. Saltwater is extremely corrosive. Please don’t put anything with a battery in salt water unless it is specifically designed for that purpose. You are quite likely to start a fire. All of the leak sensors which are readily available for home automation use are designed only for use with regular tap water. There are specialty devices you can get for saltwater fish tanks or swimming pools, but they will specify that they are designed for those environments. And I can’t think of anything designed to live in a brine tank. Instead, use probes designed for that environment and keep the battery device up out of the tank. You can also use a float switch as long as it is rated for saltwater. But again, keep whatever radio device you are attaching it to up out of the tank. If possible, I would look at using an ultrasonic level sensor. Just be sure to find a sensor that can handle being exposed to the highly corrosive salt water environment. @ogiewon ‘s post reminded me of a project I read about at robot room which uses a noncontact infrared sensor to report on the level of salt in a water softener. The author is at least aware of the corrosive issues, although I’m not crazy about his idea of waiting to see if he has a corrosion problem before adding a housing, because of the fire hazard. But it’s a well described project and might give you some ideas. I do like the idea of the infrared sensor though, makes sense. The author at robot room points out that you’re dealing with both liquids and solids inside the brine tank, which does complicate things for a traditional float. I created a simple low cost solution using a multipurpose contact sensor. See a vid of it here.